As the son of Eritrean refugees, Johannes Debese a.k.a. Johnny D. became acquainted with a wide array of music styles at an early age – from Tigrinya, the Eritrean music of his heritage, to hip hop, funk and soul. During the break beat craze in the Rhein-Neckar delta he first came into contact with electronic music at the age of thirteen, soon afterward deciding to take to the turnetables. 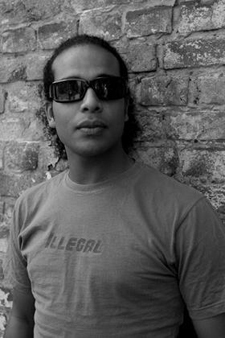 His first electronic music sets at modest breakbeat events followed, and Johnny D. quickly developed into a versatile artist active in the Mannheim collective. He met Ray Okpara in 1999 by the good grace of their mutual hip-hop interest. They would both later organize the Rajo-Music house parties and spin together at the Loft Club in Ludwigshafen. Johnny D. was also active in the Rhein-Neckar party scene as one of the co-founders (Ray Okpara, Federico Molinari, Nekes) of the Mannheim Zoo Club, which quickly rose to wild popularity with its rotating line up of national and international acts and local DJs. Johnny D’s style continued to develop under the influence of minimal electronic music, prompting him to try his hand at producing. His musical versatility makes it difficult to define his style, but one can safely locate his music and vinyl selection somewhere between deep house, minimal, and techno. The outcome of this spectrum of styles is his own style which is arising itself on vinyl and affectionately arranged live acts.